– Enhanced Intel SpeedStep Technology is an advanced means of enabling very high performance while also delivery power-conservation. Unlock Your Full Potential: Unlocked 2nd gen Intel Core processors enable system tuning, providing extra performance and flexibility for more complex multimedia applications and immersive gaming. 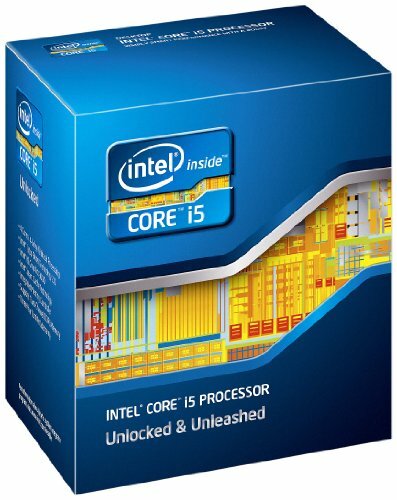 The Intel Core i5 processor delivers performance automatically when you need it with Intel Turbo Boost Technology 2.0. Get improved multitasking with these quad-core processors and a stunning visual experience from the built-in visual features. These 2nd gen Intel Core processor family delivers a visibly smarter PC experience. Improved performance, greater adaptability, and unique visual features combine for a better computing experience you can see. Whether you use the PC to be creative, play games, or for everyday tasks such as homework, these new processors make it easier for you to design, render, edit, play, and share. These 2nd gen Intel Core processors feature Intel Turbo Boost Technology 2.0, delivering a burst of processor speed automatically when the workload demands additional performance.